Disneyland was planning to use fiber-reinforced plastic in a big way--boats, castle turrets, Peter Pan vehicles--so it was obvious that Hartman's steel frame go-kart needed a plastic body. Broggie looked for a hip young designer to come up with a futuristic design. Disney special processes wizard Ub Iwerks knew a friend of his sons who might fit the bill. 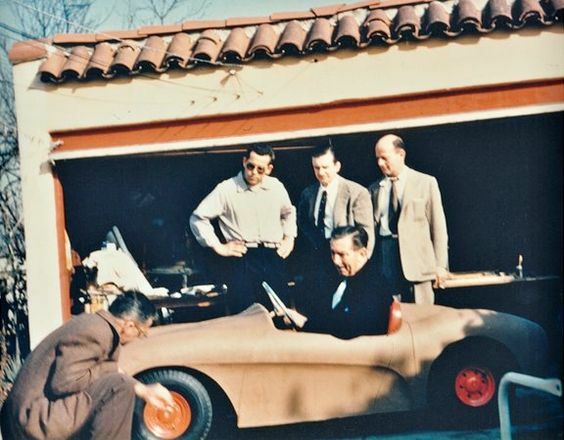 Robert Henry Gurr was 22, but he had attended Art Center College of Design on a General Motors scholarship, gone to Detroit to design cars for Ford Motor Company for a year, and was now working for industrial designer Channing Wallace Gilson (that's one man, "Gil" to his friends). Gurr was also the published author of How to Draw Cars of Tomorrow. He knew Dave and Don Iwerks through a car club called the Road Burners, but he was actually introduced to Broggie through Art Center. Gurr worked nights and weekends adapting the design of a Ferrari sports car and the 1954 Porsche 550 Spyder for the scaled-down, two-passenger vehicle. Gurr also had some ideas about the mechanics. For one thing, the car only needed one pedal. Give it gas and the seven and a half horsepower Gladden engine would make it go. Let up on the pedal and the Salisbury centrifugal clutch would make it stop. Gurr found working on Disneyland exciting and joined WED Enterprises around Christmas 1954. Gurr's model shop instructor at Art Center, Joe Thompson, had his students build Gurr's design, full-size, in chevant clay, just like Detroit. It was a great learning experience for the students, but Thompson worried that publicizing the project would swamp Art Center with requests for free work, so he kept it on the down-low at his home in North Hollywood. Broggie assumed that a car guy like Gurr knew about engines and differential gears, but Gurr was only trained as a designer. "I was trained as a car stylist, not as a mechanical engineer," Gurr wrote in 2000. "But all the other guys joining up at the Studio were doing everything Walt wanted. Okay, I better learn fast. So, not only was I doing drawings at night during the week, I spent Saturdays at the Studio drafting car parts, and learning just how much I didn't know. So was everyone else." 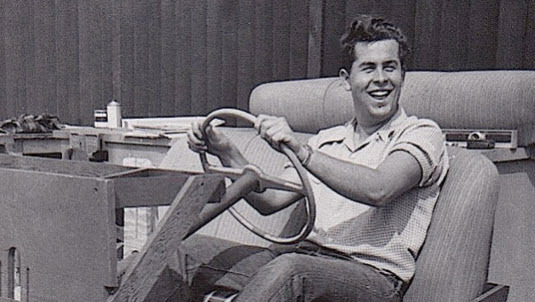 Hartman and the ride importer were annoyed to learn that Disney was developing their own car in-house rather than use their services, but Hartman did win a contract to supply steering gears for the fleet. If the importer was Eric Wedemeyer (my suspicion), he was rewarded by selling his West German Strato-Jet ride to the park for the 1956 season. 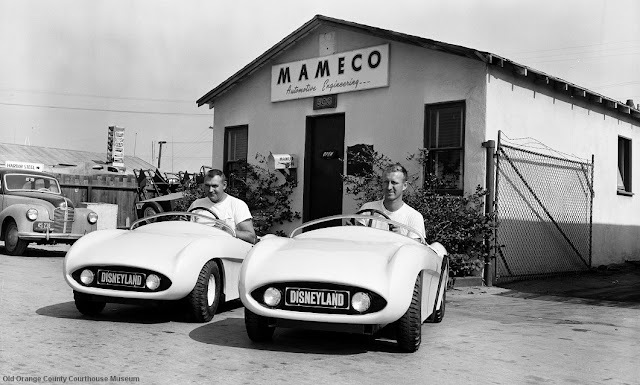 Broggie signed a contract with fiberglass pioneer Bill Tritt to make forty car bodies at his Glasspar shop in Costa Mesa, about eight miles south of the Disneyland site on Harbor Boulevard. The colorless fiberglass shells went from Glasspar to Hutchinson's Auto Paint in Newport Beach to be painted red, white, blue and other colors. Dune buggy enthusiasts Ed Martindale and his best friend Ted Mangels started their custom car shop in 1953. 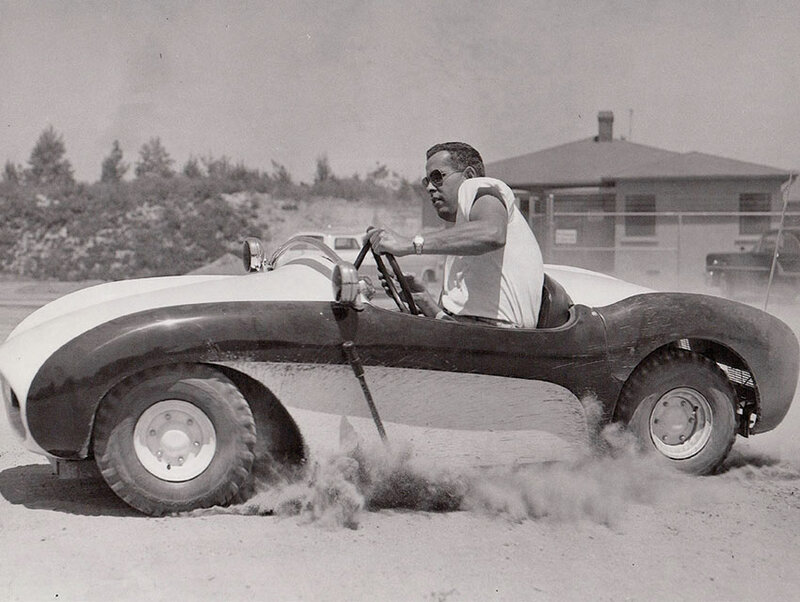 Ted would go on to win the Baja 1000 off-road race in 1967. Their company, Mameco, won the contract to assemble and test the cars. Engines, clutches, wheels and tires were bought off the shelf and sent to Mameco in Newport Beach, along with the painted fiberglass bodies, the Hartman steering gears and other components. Each car cost about $1,500--$60,000 for the fleet. The only thing that the delivered cars were missing was a bumper in case the children accidentally contacted the curb. The highway of the future had tall curbs, so that there was no way that riders could leave the road, and of course they wouldn't deliberately run into the car ahead of them. Gurr sketched a wrap-around metal bumper and imagined the performance characteristics of spring steel. Instead, he was persuaded by Kaiser Aluminum salesman Mel Tilley (a Disneyland sponsor) to use aluminum for the job. 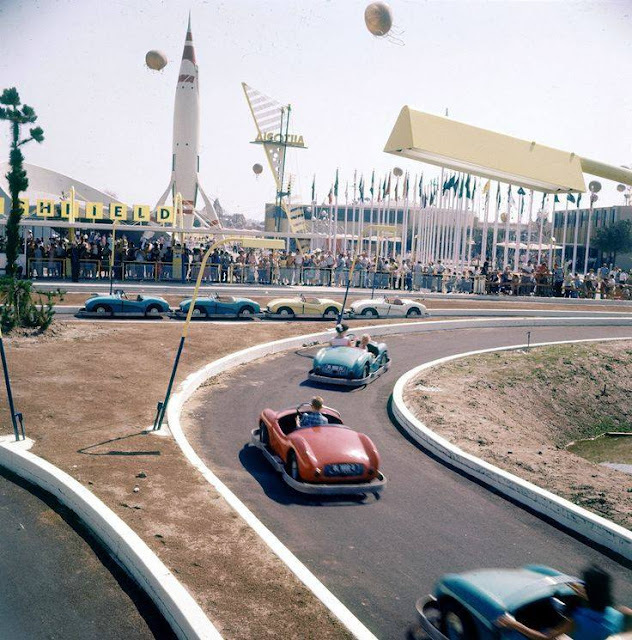 Gurr himself, along with a crew of new Autopia ride operators, installed the aluminum bumpers on the delivered cars in a circus tent surrounded by furious construction activity, just days before the park opened. The beautiful little cars were ready for opening day and nine of them joined the parade up Main Street to represent Tomorrowland (which had almost no attractions on Preview Sunday). The horrors of opening day--Black Sunday--are manifold and legendary. The summer heat caused many cars to vapor lock and stall. Some governors, designed to keep the cars below 11 m.p.h., failed, allowing the cars to jump the curb. The young drivers thought they were bumper cars--they had bumpers, didn't they?--and rammed each other with abandon, deforming the aluminum bumpers. The steel steering wheels were not padded, and the frequency of baby teeth getting knocked out earned the Autopia the nickname "Blood Alley" among operators. On camera, even Sammy Davis, Jr. deliberately crashed into Frank Sinatra.